Work is progressing at a pace on the restoration of Bradford’s Grade II* listed St George’s Hall, which is part funded by a £1.5m grant from the Heritage Lottery Fund, with the final part of the roof being completely removed by contractors Henry Boot Construction Ltd last week, two weeks ahead of schedule. 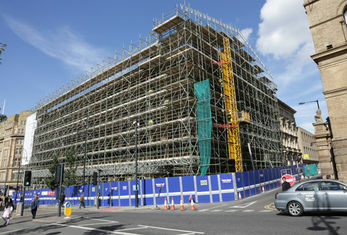 The work to remove the roof of this Bradford Council building has taken just four weeks rather than the expected six; this is despite complications with the discovery of problems with work undertaken when large parts of the roof were replaced in 1983 after it was destroyed by fire. In removing the roof it became evident that the majority of the rafters needed to be removed and replaced or reinstalled. All the works, materials and methods of installation will be checked by the Council’s conservation officer to ensure it complies with the expectations associated with listed building status. In order to meet current building regulations there also will need to be additional work to the roof including new lightning protection as well as a new access hatch and the installation of a new harness safety system to make it safe for workers to maintain the roof in future. Work to restore the roof is expected to take around 6 months.